Now you can recreate those happy memories with your own children. Family Games Night is a great way to bring everyone together, young and old, with just one goal in mind: to have fun. And what better time to start this off than during the summer, when everyone is already in a good mood? Board and card games don’t offer the instant gratification of video games, which is why they can be a good educational tool. All too often children get used to fast games with images whizzing by before they have the change to digest them properly. Board games and card games aren’t like that. They encourage social interaction, and they also encourage communication between all members of the family. They are cheap and fun, and they teach children the importance of taking turns, waiting, honesty, good sportsmanship and being a team player. 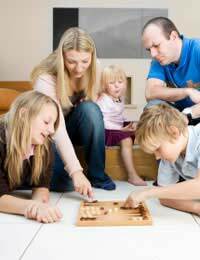 Having a regular Family Games Night will also challenge your children with real intellectual stimulation, and give them something to look forward to that doesn’t require a lot of money or advance preparation. Best of all, soon they may be asking to play games together, instead of squabbling over whose turn it is to use the computer! Summer is a great time to start having Family Games Night, when everyone is relaxed. Hopefully, though, this trend will continue throughout the year. During the school year, don’t pick an evening where children have homework to do and Mum needs to polish up her work presentation. Choose a Friday, Saturday or Sunday evening when the homework and washing up are done and everyone can focus on just being together. Make it easy on everyone – including Mum. Order in a pizza or Chinese, or eat leftovers. Encourage the children to prepare treats in advance. Pick something suitable for everyone, but be flexible. If your ten-year-old wants to play Monopoly but your four-year-old doesn’t quite get the concept, pair up in appropriate teams. Similarly, playing chess might not be a good option for a small child. Take turns. This doesn’t just mean during the game, but also in choosing what game to play. Your pre-teen might not really want to play Carpal, but catering to everyone is all part of the fun. Teach the value of winning – and losing. All too often children get discouraged when they lose, but it’s vital to learn that losing is, literally, all part of the game. Start a regular Family Games Night in your own home this summer, and your children will come to enjoy this time as something fun that brings all the family members – and all generations - together. Invite Gran and Granddad and make it a real family affair. Encourage your children to help you bake a cake, make a batch of fresh biscuits, and put the kettle on. Then break out the card and board games – nobody will be bored for long!